A while ago it hit me. I want to do more. I want to do more to impact people with God’s Word. Sunday morning isn’t enough. I want to teach more. The people in the pews aren’t enough. I want to reach and serve more. And so a desire to bring God’s people into God’s Word through daily prayers, through reading plans, and now a podcast were born. It is my prayer and my purpose to do what I can to teach, to preach, and to equip God’s people for living a life for Jesus, so that you are thoroughly equipped for every good work, so that you’re ready for life. It is also my prayer and my purpose to do all I can to preach Jesus to you so that you may believe that Jesus is the Christ. There are lots of things I could teach you about living for God now. But my main concern is that I might be able to teach you about living with God for all eternity. I want the words that CS Lewis writes in The Last Battle to be yours. The Last Battle is the final book in the series ‘The Chronicles of Narnia.” As the title suggests, it tells the story of the last battle. It is a battle between characters who resemble the anti-Christ and the hosts of hell fighting in the final battle against the followers of Aslan, i.e. those who believe in Jesus. It pictures the final battle that John describes in Revelation. One by one those who believe in the one true God enter through the door into eternity. In the moment when they die and enter through that door, they don’t know what is on the other side. But as they pass through that door, one by one, they say things like this: “I have come home at last! This is my real country! I belong here. This is the land I have been looking for all my life, though I never knew it til now… come further up, come further in!” - The Last Battle by C.S. Lewis. After entering through that door they realize and learn that there is always more to be explored, always more to see and experience. Though CS Lewis was describing what we might experience in heaven, we can say the same thing about the Bible and our study of it. There is always more for us to learn, always more to see, to study, to experience. We can continue to go further up and further into God’s Word. We can continue to grow closer and closer to our God. We can learn to walk in a tighter and tighter walk with him. This is what I hope, with God’s strength and as he will’s it to prepare and provide. 3) If you want to cover more of the Bible – Go! Get after it! – I will also provide here a reading plan that will get you through the whole Bible in one year. 4) I will provide 6 days of readings and prayers. I pray that the seventh day will be a day of rest in God’s house where and when we will gather for worship and meditation together. God bless our time in his Word as we go further up and further in there. I can't wait for Thanksgiving. It's going to be a great time. I can't wait for thanksgiving, but not because of the food. I love turkey and stuffing, but I can eat other food. I love the pies and other desserts, but I eat those all the time! (Yes, it's a problem.). But what I love most is preparing a meal, setting the table, and pulling out some chairs for people who are near and dear to me. I love to be part of the meal preparation. I love to be part of the meal orchestration. I love to prepare a meal for the people I love. I love to set a place and prepare a meal for the people I care about. That's what we're doing for you every Sunday. We're preparing a meal and saving a seat for you. And it's going to be good. It's going to be a feast of forgiveness and God's graces poured out for you. It will be like honey on your tongue. It will be like sitting down at a full course meal at Ruth's Chris Steak House to enjoy a perfect cut of steak and grilled asparagus, paired with the perfect wine. This is not the drive thru at McDonalds. This is the good stuff. We're setting a table for you of God's Word, food for the soul. We're setting a table of God's Word, a message from God himself, that has been aged from the days of Moses and it has stood the test of time. It is inspired by the Holy Spirit and it is pure and perfect in every way. It is living and active, not some dead message that has passed it's time of application. It is useful for everything - for teaching, for rebuking, for correcting, to teaching, for training in righteousness. This is the good stuff. We're setting a table for you of songs and hymns and spiritual songs that unite us to saints of the past and saints of the present too. We get to express our faith, express God's Word in song. We're setting a table full of these hymns and songs for you. This is the good stuff. We're setting a table for you with a sermon that is stewed in my heart by the Holy Spirit as I meditate on the Scriptures for you. This isn't something I spit out on Sunday morning, something that comes off the cuff. No, this meal in the sermon comes from hours of study, hours of prayer and mediation, and hours crafting a message that, by God's Spirit, will touch your heart and transform you into God's image, holy and perfect like this Son. This is the good stuff. So, I hope you'll come. I hope you'll come to the banquet that we're setting for you this Sunday. There is a seat just for you. We picked hymns and prepared a worship service with you in our hearts and minds. I hope you'll come because I'm praying for you and I'm praying about you as I work on the sermon for this Sunday. I'm preparing a meal with you in my heart and mind. 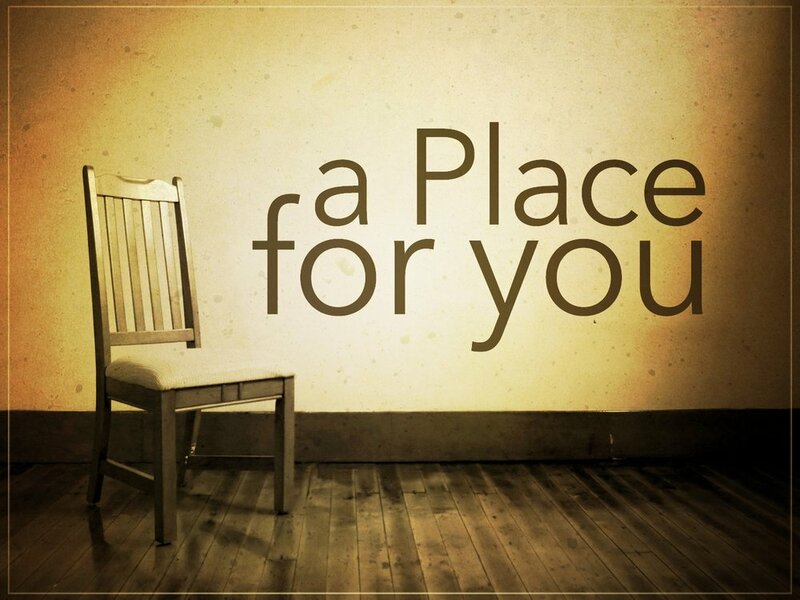 I'm setting a seat and preparing a place for you. The table is nearly set. It will be fully set by 10 am this Sunday. (Don't forget about the time change!) Come, come and eat a banquet of God's Word, of songs and hymns about God. Come and eat and your soul will delight in the richest of fare. We love our church. That’s why we belong to it. That’s why we go every Sunday. We love the message we hear. We love the gospel we share. We love the hope we hold. We love the grace we receive. We especially love the Savior whom we hold and share. There are so many reasons that we love our church and why we keep on coming. Abiding Faith is far from perfect, but we love it. This Sunday, October 1, we want to invite you to come get to know us. We’re having a special, outdoor worship service and lunch to follow. It’s all free. If you’re looking for a church, we’d love to have you come check us and get to know us and get to know our message. If you’re not looking for a church, come anyway. You might just find out that you should be! We’d love for you to come and get to know us. If you’re still not convinced, let me give you five reasons why. What else do I need to say? It’s not that we’re particularly good at making food (though I think we’re pretty good). We love to eat together because of the relationships that happen over food and behind a cup of coffee. This Sunday we’re having a simple pulled pork lunch. Every other Sunday we have a snack (that sometimes looks like lunch!). Once a month we throw a potluck and we see what happens. It almost always feels like the feeding of the 5000. We love our food. #2 – The Worship and Music. We love to get together in Jesus’ name and around his Word. Jesus promises us that when we do, he is there with us. And when we get together in Jesus’ name, we love to sing. Some of us can’t carry a tune in a bucket. We’re not professional musicians so it won’t be a concert. That’s okay. We’re not trying to be. We just want to get together with Jesus and his friends. We want to sing to him. We want to sing about him. And we will! Someone recently suggested that the “Cheers” theme song should become our own at Abiding Faith. All the lyrics seems to fit. We are a place where everybody knows your name; at least we try really hard. And we are definitely a place where everyone is glad you came. When you come to Abiding Faith you won’t get lost in the crowd unless you want to sneak out. You’ll find a place where people are genuinely glad you came. You’ll find a family who will walk with you to heaven. We’re not perfect; after all we know that the church is a hospital for sinners, not a museum for saints. But we’re saved by Jesus and cleansed by him and we’re doing our best to love each other – and to love you – the way Jesus loved us. Now, we’re getting to the good stuff. Oh, don’t get me wrong the other stuff was good too, but there was always some sort of qualification. Our food is good, but you might not like it. Our worship is great, but the musicians aren’t professional. The people are friendly, but they’re still sinners. That stuff is good, but there is always a “but”. Not here. Not with God’s Word. When you come to Abiding Faith you’re going to get God’s Word, straight up. In fact, let me challenge you, “If we can’t prove what we’re saying from the Bible, then don’t listen to us.” Try. If we’re getting it wrong, we want to know. We’re going to give you God’s Word, period, as God said it, as God gives it. This is why we exist. We’re here to help people meet Jesus and walk with him to heaven. Jesus is the One who gives us hope. Jesus is the One who came from heaven to suffer, to die and to rise again. Jesus is the One who heals our hurts, who forgives our sins, who raises us from death to life. Jesus is our everything. And finally, this is the one and only reason we really want you to come. We’d love to feed you. We’d love to give you worship and music. We’d love to meet you and walk with you. But most of all, we want to open up God’s Word with you and give you Jesus. We want you to meet him. We want you to know him. We pray that you’ll believe in him. So, come on. Check us out this weekend. Our services are always at 10 am. This Sunday we’ll just be outside. Bring a lawn chair (or we’ll have some chairs to share) and get comfortable. Then, stay for some lunch. We pray that this will be a great weekend for you and for others to come and meet us and see who we are and what we’re all about. These are the five biggest reasons. Hope to see you Sunday. I have a problem with the sermon I preached last week. And it’s kind of been bothering me all week. Now, don’t get me wrong I’m not ashamed of it. I’m not apologizing for anything I said. I’m not even saying that anything I said is wrong. It’s that I finished preaching the sermon, I went home and went about my week. And nothing had changed. I felt and I feel as much a captive of sin as I had before. I’m still struggling with the same sorts of insecurities and weaknesses that I felt before. I preached the sermon; I listened to and took to heart what the sermon was about. But nothing changed. Now, if you missed the sermon, I’ll encourage you to listen to it. It’s all on our website: my242church.com. In a nutshell, the sermon was this: Live with baptismal swagger; live with a baptismal backbone. Through your baptism you are victors over sin, not victims under sin. Sin doesn’t own you; Jesus does. I wanted you to get up from worship and live a conquering life throughout the week, sure of your salvation, not letting sin own you or rule over you anymore. Don’t get me wrong, I’m not apologizing for anything I said last week. I’m just saying that nothing has really changed for me. And I want things to change. I don’t want to struggle with the same insecurities. I don’t want to fight with and even give into the same temptations. I just don’t want to do it anymore. I feel as helpless against sin as I ever have. And all week I’ve been struggling with this question: How can I beat sin? I sigh as I ask the question. I imagine you’re in the same boat. Still worrying? Still full of anxiety? Still struggling with depression? Still struggling with lust? Still fighting with addiction? Still sighing because of sin in your life? Yeah, me too. I’m still at it. So I thought, maybe I just need to study what God says about my problem. That’s good, right? Maybe I just need some more guidance from God’s Word. Maybe if I just dig into God’s Word, try to find some good steps from his Word. Maybe if I read some good Christian books about my struggle. Maybe if learn more deeply what the Scripture says, get some steps to follow. Maybe if I dig into the truth of God’s Word I can get a better grip on my struggle. And that helped for a while. It made me feel powerful over my struggle, like I had a fighting chance. But, after I was at it a while it just made me feel worse. It exposed my weakness and my struggle in a new way. Oh, don’t get me wrong. It got better for a little while, but all this helpful guidance from God’s Word didn’t really help in the long run. It just left me with a greater burden to carry. So I thought, maybe I just need more people to help me. Maybe I just need some more accountability from God’s people. That’s good, right? AA and other addiction programs claim that accountability is one of the keys to a successful victory over any addiction. There is power in accountability. And I believe it. In fact, I crave it. I have an accountability partner who is helping me in one area of my life. I love him and the help that he gives me. But I’ve noticed this. Every time we’re about to talk – I can see it on the calendar – I get a little more serious about the to-do list that he gave me the month before. And he’s helping me. But if I’m honest about all of this – all accountability does is make me feel worse and more ashamed because I’m still not cured. And so here I am still frustrated about my life, still sighing about my sins, still struggling against temptation. Still in a funk. Still sighing. Nothing has changed. I'm no better than I was before I studied the text or preached the sermon. Christian guidance is good, but it only leads to sighing. All these Christian self-help and self-improvement books do is give us God’s law. They give us steps that we can take, things that we can do so that we can fix our life and our relationships. All these books are is a glamorous to-do list, a glorious restating of God’s law for our lives. And that’s good. God’s law is good. We know it’s good. God gave it to us and everything that God gives us is good. But here’s what happens. As soon as we open up God’s guidance and God’s law, it crushes us. It condemns us for failing. It even shows us that we’ve failed far worse than we ever thought he had. And then, when it comes to fixing our lives, it only lays more and higher expectations on us. “Do this and this and this and everything will get better.” But it never does. It only crushes us with condemnation. It only lays a higher and heavier burden on us. Christian guidance is good, but it only leads to sighing. Maybe you’ve even reached out to a good friend for help, for guidance and maybe even accountability. You’ve opened up to a friend about what you’re struggling with, where you’re hurting. You’ve even asked for help. And that’s a good thing. Accountability is a great thing, a powerful thing. But accountability does not reform me. It just puts pressure on me to perform. Accountability from Christian friends is a blessing, but it only leads to sighing. That’s what I do whenever I’m about to talk to my accountability partner on the phone. It just crushes me deeply when I fail. It just puts my life under the microscope of someone whom I love and respect. Now someone else is watching my life and he/she is going to ask me about it next time we talk. It’s juts another law in our life. It’s a good law. A blessed law. But still a law and a curb for our lives. And this always leads to sighing. The law – whether it comes in the form of self-help advice, ten steps to breaking free from addiction, or even just from accountability – it’s good. The law is good, through and through. But all it ever does in us is lead to sighing. Sighing because we haven’t measured up. Sighing because we’re burdened with the law’s expectations. Sighing because of the law’s condemnation. The law always leads to sighing. In fact, sighing is what Paul seems to be doing through this whole chapter. He expresses with sighs the very same things that I struggled with all week after a sermon about beating sin. He expresses with sighs the very same things that you wrestle with all the time. He confesses that the very law that was intended to bring life, actually brought death. I found that the very commandment that was intended to bring life actually brought death. For sin, seizing the opportunity afforded by the commandment, deceived me, and through the commandment put me to death - Romans 7:10-11. God had promised his people that if they followed these commandments then they would live. He had told them, “Just do these ten things without failing and you will live.” And he still holds out that promise today. If you’ll just do these ten things and obey me without failing, things will be good for you. Just obey me and things will be good. But what happens? Sin takes the good commandments and puts us to death. For I know that good itself does not dwell in me, that is, in my sinful nature. For I have the desire to do what is good, but I cannot carry it out. For I do not do the good I want to do, but the evil I do not want to do—this I keep on doing - Romans 7:18-19. What a wretched man I am! Who will rescue me from this body that is subject to death? - Romans 7:24. That’s all there is to say. That’s all we can do. Dive into the law all you want, but the law cannot reform or resurrect you. Dive into self-help books all you want, but they don’t have power to change you or compel you. Get as many accountability partners as you want, but they don’t have the power you need to actually change. All this leads to sighing because all this is law. The law cannot give us life; it can and will only crush us and lead us to sigh. The law cannot give us life. So, my brothers and sisters, you also died to the law through the body of Christ, that you might belong to another, to him who was raised from the dead, in order that we might bear fruit for God - Romans 7:4. This verse and this truth is the cure to our sighing. This verse and this truth will bring give us back our joy. We have life and freedom through his death; his death means our death. The law has no power over us anymore. The law cannot accuse. The law cannot expect. The law cannot convict. We died to the law. Now we belong to Jesus to live a new life. Join us tomorrow (7/30) or check out the posted sermon on Monday to dig deep and to understand how much joy and how much freedom we really have. I feel better already and I'm only getting warmed up. No more sighing! Just joy, great joy. 500 years ago, Martin Luther triggered a seismic upheaval that rocked the western world—with an impact that continues to reverberate to this day. This entertaining new film follows the great adventure story of Luther’s life, packed with political intrigue, kidnappings, secret hideouts, and life-or-death showdowns. At the same time, it's a story about the most important questions of life. "Who am I?" "What is my purpose?" "How do I get right with God?" It’s a must-see for any lifelong Lutheran, and a chance to share the message of our Lu- theran heritage with others. And the only place you can see the film is at AMC The Parks At Arlington 18 — 3861 South Cooper Street, Arlington, TX, United States, 76015 on Wednesday, August 16 at 7:30 p.m.. This screening is the perfect outreach opportunity—a chance to invite friends and neighbors to an entertaining event in our community. This is the first time in more than 60 years that Lutherans have made a feature-length film about Martin Luther and the Reformation. Filmed in historic locations across Eu- rope, this movie brings Luther’s story to life with exquisite attention to detail. It’s a way to strengthen our faith by revisiting the birth of the Protestant Reformation, and a chance to share that experience with others. IMPORTANT: All tickets must be purchased in advance. In addition, we need to sell 95 more tickets to confirm our event. God's love - Are you sure? God’s promises are awesome. And the Bible is full of them. Each promise is meant to assure us that God is up to something and that he is going to do something. God’s faithfulness is comforting. It is such a comfort to know God is true to his Word, that he will keep his Word, that he does not change. His faithfulness assures us that he doesn’t change and that his promises are sure. God’s power is astounding. The fact that God actually has the power to do what he said he was going to doing is overwhelming. He can do what he said he was going to do. He has the power. He has the ability. Does the we include me? Paul starts this next section of Romans with a “we.” He says, “Since WE have been justified by faith, WE have peace with God through our Lord Jesus Christ” (Romans 5:1). But when there is no peace in our lives, when we face trouble and hardship, we want to ask the question, “Does the we include me?” Does God love me? Is God good for me? It may be true that he is love and that he is good, but is he good for me? I certainly don’t feel the good in this. I certainly don’t feel the love in this. And I certainly don’t rejoice in it. Maybe you feel this in your hearts right now. Maybe today you feel like God doesn’t love you, that God doesn’t care about you, that God is not doing good things in your life. You listen to a sermon and you think to yourself, “That’s nice and all, pastor. But that isn’t true for me.” If this is how you feel, then this is a sermon for you. Or maybe you don’t feel right now and you’re not thinking this. Maybe you are quite sure of God's love for you. This is still a sermon for you. Whether you’re despairing of God’s love or whether you are quite sure of it, Paul helps lay a firm foundation so that we will always know and even rejoice in God’s love. Paul wants us to know that the WE does include ME. Paul wants you to know and be sure of God’s love for you. It's all in the verses before us this Sunday. Read Romans 5:1-11 in prep for Sunday. We'll look specifically at Romans 5:6-11. Eternal Father, Ruler of all nations, on this day when my country celebrates its birth, I thank You for all spiritual and temporal blessings enjoyed in our land. In Your mercy, You have sustained this nation in times of trouble and preserved its liberties. Teach me anew to treasure especially that dearly won freedom of conscience and worship that is the cornerstone of this country’s principles. Let me not misuse this liberty nor forget that true freedom is freedom to serve. Give me willingness to share in the process of democratic rule, to respect my country’s laws, and to work for the preservation of its institutions. Forgive our past sins committed as a nation in the name of misguided patriotism, self-interest, or political expediency. Confound all those who, for the sake of partisanship or other motives, would sacrifice the greater welfare. Grant wisdom to our leaders. Strengthen all those who strive to do Your will. Increase loyalty to You and to our beloved country. Protect me and my fellow citizens from all subversive or terrorist acts. Above all, dear God, speed the course of Your Gospel among us, so that by the power of the Holy Spirit, hearts are turned to that freedom from sin and death that You alone graciously give through Jesus Christ. Amen. People say that faith is foolish, that faith is blind, that faith is hiding our heads in the sand and ignoring the evidence. People say that faith in God is for the weak, that faith and religion is an opiate for the masses, meant to calm us down and get us through life. People say all kinds of things against faith because they say and truly think that faith is a foolish thing. I agree. Kind of. I agree that faith can be foolish. It’s foolish for me to think that a paper airplane could carry me from Chicago to DFW. It’s blind to think that things will be better without any promise or guarantee about what tomorrow will bring. It can be hiding our heads in the sand and ignoring what we’re seeing with our eyes. I agree with the accusations. Kind of. It all depends on what you’re trusting. It all depends on what you’re believing. It all depends where you place your faith. This Sunday (7/2) the apostle Paul sets before us an example of faith in Abraham that I would hardly mock or ridicule. Abraham faced the reality of his life. Abraham faced the hopelessness of his situation. He faced the facts. But he placed his faith in his God who promised him, “I will keep my Word.” God even verified and ratified the promise in a solemn ceremony that sealed it with Abraham again. Look it up. It’s in Genesis 15, especially verses 5-6. This doesn’t mean that Abraham didn’t struggle. This doesn’t mean that Abraham didn’t doubt. He did. We wavered. He questioned. He wondered how and even if God was going to do it. But then God came and promised him again, “I will not let you down. In fact, I will remain faithful to you into future generations.” Look it up. It’s in Genesis 17, especially verses 4-8. But still Abraham struggled. He was facing the facts of his body. He was facing the facts of his age. He even began to laugh when God told him that a man 100 years old would have a child! How crazy is that! He wasn’t blind to the realities. Yet God came and reminded him, “I am able to do what I have promised.” God’s power and God’s promise were (and remain) greater than the realities that Abraham faced. Look it up. It’s in Genesis 18, especially verse 14. I’m telling you all this because I want you to begin to know Abraham’s story. It’s the illustration that Paul uses in Romans 4 to teach us about faith. If you want to learn more about his story you can read the whole account of Abraham’s faith in Genesis 12-22. It will give you a depth of insight into Paul’s teaching about faith in Romans 4:18-25. See you Sunday. "Nothing surprises me." I keep telling my congregation that. Sometimes I think that they think they can. They're afraid to confess their sins. They're afraid to talk about what they struggle with. Part of it is shame and embarrassment. Part of it is guilt. Part of it is not wanting to confront the sin in their lives. But I keep telling them, "Nothing will surprise me." There are somethings in this world that are like that, something that won't surprise us. They are obvious and clear to all people. Our sin and sinfulness is clear (it may be denied and rejected, but it’s clear). It’s clear (but rejected and suppressed) to the godless (Look at Romans 1:18-23). It’s clear and felt by the consciences of people, even on those who don’t have the law (Look at Romans 2:14-15). It should be especially clear to those who have God’s law written and handed down (dear Christians – don’t think that you are above this). We know it's true. We can feel it; it’s in our bones as our bodies decay. Our bodies know long before our hearts and minds that we’ve failed. But there is something that doesn’t come intuitive, not to us, not to anyone. There is a natural knowledge of God that all people have – whether they accept it or suppress it (But you might as well face it now rather than later). This doesn't surprise me. It shouldn't surprise you. But there is a knowledge of God that must be revealed. BUT NOW, Paul says, apart from law a righteous of God is revealed. God surprises us by revealing something new and saving. He reveals a righteousness by which God justifies the ungodly. He reveals a righteousness by which he justifies all people by his grace, through the redemption of Jesus. He shocks us with the surprising revelation of what God did when he sent Jesus. He set him forward as the sacrifice for the sins of all people at the proper time. Until then, he was holding back his wrath like a pent up flood. And then, in the coming of Jesus, he gave surprising evidence of his righteousness – a righteousness that punishes unrighteousness and a righteousness that is given through Jesus. So, you can't surprise me with your sin and your sinfulness. And I can't surprise you with mine. But we can surprise each other - as Paul surprises us - with a revelation of righteousness and forgiveness from God. Join us this Sunday (6/25) we dig deeper into these truths in Romans 3:21-28. For the last ten days or so some of our kids have been off galavanting around the northern states visiting with their grandparents, some aunts and uncles and even a few cousins. It's a wonderful experience for them, but for those of us left behind - especially Ruth and I - we can't wait to see them again. They're coming home tonight and we can't wait to pick them up. “I am so eager to preach the gospel to you” (Romans 1:15). Those were Paul’s sentiments to the Romans whom he had never met, but whom he longed to visit so that he could encourage them and be encouraged by them. But before he even visited them or met them face to face he launched into a letter to them. It is a beautiful, Gospel-rich, Christ-centered letter detailing the gospel about Jesus and showing the beauty of the gospel with all it's facets. He was so eager to preach he gospel to them that he wasn't going to wait until he was able to visit them to share it. He was going to send them a letter overflowing with gospel promises. This Epistle is really the chief part of the New Testament and the very purest Gospel, and is worthy not only that every Christian should know it word for word, by heart, but occupy himself with it every day, as the daily bread of the soul. It can never be read or pondered too much, and the more it is dealt with the more precious it becomes, and the better it tastes. That's the way I feel as I prepare to start a walk with you through the book of Romans. I can't wait to unpack and share this gospel with which Paul has filled this letter. I can't wait to hold up this gospel to you as a diamond. I can't wait to turn it around in front of your eyes so that you can see it's dazzling beauty from every angle. And then, beyond just seeing it's beauty, I hope that you come to see in a greater way that this diamond, this treasure of the gospel, is yours. It isn't a treasure in my hand, that I'll bring out on Sunday and then put back in it's box until the next week. It's a treasure in your hand that, by faith, you get to take and put in your heart and carry with you throughout the week. This gospel changes everything! It is a #gamechanger. This Sunday (6/18) we'll begin our joyful walk through the book of Romans. Trinity Sunday is one of the few celebrations of the Christian Year that commemorates a reality and a doctrine rather than a person or event. On Trinity Sunday, Christians remember and honor the eternal God: the Father, the Son, and the Holy Spirit. The Trinity is one of the most fascinating - and controversial - Christian teachings. The Trinity is described as a "mystery." By mystery the Church does not mean a riddle, but rather the Trinity is a reality above our human comprehension that we may begin to grasp, but ultimately that we simply believe. It has been said that mystery is not a wall to run up against, but an ocean in which to swim. Common wisdom is that if you discuss the Trinity for longer than a few minutes, you will slip into heresy, because you are probing the depths of God too deeply. And so we simply and clearly confess the Trinity and rejoice in the reality that this is who our God is - One God in three persons and three persons in one God. As we wrap our "One" series in the morning (6/11/17), it's fitting that we finish at the close of Paul's second letter to the Corinthians (2 Corinthians 13:11-14). Here Paul has some closing exhortations for us as we seek to build and strengthen the unity that the church already has through faith in Jesus. We also find great hope and comfort in the promised blessing that comes from our Triune God. For the rest of the series. Easter Sunday was a wonderful celebration. We were outside and all our chairs were used and then some! Let's do it again! This time we'll be inside and this time we'll crank up the organ nice and loud (couldn't do that outside). The choir will sing their anthem again. The kids will sing theirs. It will be a great day. We'll do this on April 30. We'll even have some special snacks after the service. This will be another joyous celebration. We'll go big AGAIN!! Here are the hymns that we'll sing or that will be sung for us! Gr8er - Basking in the glow of Easter! This is what Easter is all about. It is a detailing of the otherwise unbelievable love of God in the sacrifice of his own Son for the likes of us sinners. It is an unveiling of the incredible victory gained by Jesus over all our sins, even over death itself. God gave us his Son. His Son conquered the grave. His Spirit resurrected faith in our hearts. And we respond with overwhelming confidence and shouts of praise! Come death, come angels or demons! Let the past haunt me, the present scare me and the future terrify me! It is all nothing; the love of God in Christ leaves me at peace and secure. Paul shows all this to us in Romans 8 as he details for us the freedom, the love, and the power of God in our lives. This Sunday we're beginning a brand new series looking at Romans 8. This Sunday we find Gr8er Freedom in Christ and by his Spirit. Romans 8:1-11. Mark your calendars! EASTER TAKE 2! Easter Sunday was a wonderful celebration. We were outside and all our chairs were used and then some! We were able to share the gospel of the resurrection!! Let's do it again! This time we'll be inside and this time we'll crank up the organ nice and loud (couldn't do that outside). The choir will sing their anthem again. The kids will sing theirs. It will be a great day. We'll do this on April 30. I'll get a list of the hymns out to you so you can be excited about the chance to sing some of your favorites!! This will be another joyous celebration. We'll go big AGAIN!! Easter is tomorrow! Sundays coming! Tomorrow is Easter! It's the day we celebrate with full voice and great joy the resurrection of our Savior, Jesus from the dead. I can't wait. It is one of my favorite Sundays of the year. I've got a message burning in my heart to share with you. God's Word is filled with such hope for us. I can't wait to show it to you and share it with you. Below is the schedule and then the hymns that we'll be singing together! It's going to be a great day. Palm Sunday (4/9) is festive worship service as we enter our remembrance of and rejoicing in the last week of Jesus' earthly life and leading up to his crucifixion. Come worship with us as we lay down our palm branches and sing praises to our King. Worship starts at 10 a.m. Snacks and fellowship follow. Maundy Thursday (4/13) is the day that Jesus instituted the Lord’s Supper and, later, was betrayed by Judas and handed over to be condemned. This is a solemn night of worship for us as we remember the events that took place. It is also a night of hope for us because we know where this all ends. This year our service will follow the order of events that took place on this evening from the washing by Jesus of his disciples feet to the abandonment by Jesus’ disciples. The service begins at 6:30 p.m.
Join us for our Good Friday (4/14) worship service, a quiet, contemplative service of darkness as we remember and meditate on the suffering and death of our Savior, Jesus. It was a dark day. It was the day the brought life and salvation. Join us for a Tenebrae service (Service of Darkness) at 6:30 p.m.
Easter is a special time at Abiding Faith, and we want you to be a part of it! Join us as we celebrate the Resurrection of Jesus with a message of greater hope in Jesus, upbeat music, refreshments, an Easter egg hunt, and even a free family photo to catch you at your best. Most of all your family will leave with your hope renewed and your soul refreshed because of the hope that Jesus’ resurrection gives. Bring the whole family and celebrate Easter with us. We can’t wait to meet you. Last week (March 19-25) 10 students and 2 chaperones, including Pastor Jon Leach, came from West St. Paul, MN and St. Croix Lutheran High School to work with Abiding Faith in our community. This is their story in pictures. As Peter, James and John woke up, a bit startled from their sleep, cobwebs still grasping at their eyelids, they heard a discussion they didn’t quite understand. They saw Jesus glorified, glowing white like snow and flashing like lightning. Moses and Elijah were there two. As these three—Jesus, Moses and Elijah—talked, the subject matter was clear. It was time for Jesus to depart. It was time for his work to be completed. Thus, Jesus and his disciples with him were prepared for the difficult work to come. Easter is the high point of the Christian church year. It is the time when we celebrate the ultimate fulfillment of God’s promise to send a Savior and the completion of Jesus’ saving work. The church has long recognized a need to prepare for this celebration, and therefore Lent has been celebrated since the time of the early church. Lent is a season of repentance in which we remember the reason that Jesus was born of a virgin and suffered death on the cross, namely, our sin. In this way, Lent serves as a somber time in the church year, but this somber spirit is always hopeful and anticipatory. It looks forward to God’s greatest gift. It reminds us not only of God’s grace, but of our absolute need for Jesus. During Lent there are many ways in which the penitential nature of the season is accentuated during the worship service. For example, hymns of praise, as well as alleluias, are often omitted. Since Lent accentuates our humility before God as sinners, congregations may invite kneeling during certain parts of the service as a sign of humility and submission. Through this practice, the members are able to involve their whole bodies in the penitential nature of the season. Despite the penitential nature of Lent and the various reminders of the solemnity of this season, we remain focused on the Gospel of Christ, who is central throughout this season. Lent is to serve as a preparation for the celebration of our salvation on Easter Sunday. In order to prepare for this celebration we are reminded of our absolute need for salvation and our complete inability to save ourselves. Lent reminds us not only of our need for Jesus, but of God’s absolute love for us. Join us for our Lenten Journey on Sundays at 10 am when we will be looking at the Gospel of Mark. Or come on Wednesday evenings at 6:30 pm when we will be looking at the Lord's Prayer, the best prayer ever. The Color Symbolizes: The color purple is a sign of both royalty and self-disciplined responsibility. In ancient times it was an expensive color to produce (requiring the “blood” of snails), and therefore it came to symbolize the “richness” of royalty as well as the self-sacrifice required to purchase it. In this way purple became a symbol of repentance. Length: 40 days (The first recorded reference to the specific number of days in Lent was in 325 AD by the Council of Nicaea.) These forty days take us from Ash Wednesday up until Palm Sunday, which marks the beginning of Holy Week. Sign up with your email address to receive regular updates. About a week ago we came home from my son’s play. It had been a great night. Opa was in town. We saw the play which was really well done. Our son did great. Then, we went and celebrated together. We got Opa settled in and came home to our car pretty seriously vandalized. So, there we were at about midnight, troubled because of what had happened, wondering about our next step with our car needs to be, and upset because someone seems to have come after us in some sort of vindictive way. We’ve all been in moments like these where something happened or someone came after us as an enemy would. Our gut reaction is often vindictive and hateful. It’s spiteful and mean. And we justified in these emotions and responses. But Jesus shocks us by urging a very different response to those who come after us. #WWFD. “What would your Father do?” is a question that Jesus would have us ask at moments like these. Lord, help me to live and love like you in any and every situation. We are shaped by the people around us. Our parents, our siblings, our friends, our classmates, our teachers all have a very distinct and powerful impact on who we are, the way we think, even the way we talk. Parents – you know that it’s true. You’re starting to sound like your mother or father. We are shaped by the culture around us. We live in a great country and it has a very distinct culture. That culture is blasted at us in TV shows and on Netflix. That culture is quietly pushed at us through the news and radio. That culture is even shaped by the laws and mentalities of our nation. We are profoundly – more than we even know – shaped by the fact that we live here instead of in some other country and in some other part of the world. As Christians this often means that the way we think and even the things that we believe are often shaped by the Bible and culture, the Bible and family, the Bible and … I think you get the idea. But what happens when the shaping isn’t so good? What happens when the world is shaping our thinking, our acting, our feeling in ways that violate God’s way of thinking, acting and feeling? What happens when we’re taught things at home or in school that directly contradict or quietly circumvent the truth that God has given? Sadly, Christians are often molded by culture instead of molding culture by their Christianity. But this isn’t anything new. In Jesus’ day, the church of Jesus’ day was teaching some things about God’s Word and specifically about God’s commands that weren’t quite what God had in mind. The thinking and even the teaching of the church had been shaped in a way that violated God’s clear words. Jesus had some work to do. He had to clear up some things. He had to set some things straight so that his disciples would have a clear understanding of the way God wanted them to be and to live in this world. He was chiseling them and shaping them by teaching them to the truth. I’ll be honest, this next section of the Sermon on the Mount is going to get a little uncomfortable. Jesus is going to take his chisel to our teachings, to our attitudes, at our hearts, even at our lives. And it’s going to hurt. But we need it. Our eternity depends on it. Jesus says so. More and more we need to conform our thinking, our feeling, our attitudes, our very lives to the Word and will of God. It will be painful. But it will be good for us. This Sunday we will be studying Matthew 5:27-30. This section and the others around will profoundly and powerfully shape our thinking and our behaving in this world. Lord, shape us by your Word. Lord, help us by your Spirit. Lord, save us by your Son. Amen. Of light bulbs and revelation. It’s an earth shattering thing when it hits you one day that everything that you knew and understood growing up was wrong. Yikes! Your parents were wrong. Your spiritual leader and care-giver was wrong. Your religion was wrong. Your creed was wrong. All of a sudden, the light bulb went on and you saw where they were wrong and where God was right. That’s what happened to the apostle Paul when he was on his way to Damascus. He had grown up a good Jew and did what all good Jews did. He followed the rules that his parents and the rabbis handed on to him. Except Paul was more than a good Jew. He was a great Jew! He was not just a follower of Judaism, he was an advocate of Judaism and worked tirelessly and aggressively to put down anything opposed to it. And then one day, God rocked his world and showed him the truth. Then one day, God shook his heart. In that moment and in the moments that followed, Jesus turned the light bulb on and Paul saw that what he had been taught had all been wrong. He was trying to be saved by morality, but morality without Jesus is demoralizing and only ends in defeat. In that moment, Paul discovered that everything he had learned was wrong. Jesus the same thing as he sits down with his disciples and with the church of his day and says, “Let me fill in the gaps for you. Let me help you understand the law and the prophets. Let me help you understand the Scriptures. Let me turn the light on for you.” Already then they were missing some key parts of the Scriptures. They were teaching some of the Scriptures, but not all of it. They were teaching morality and ethics, but not grace and redemption. Too often the Christian church is known for its morality and ethics. And Jesus did teach morals and ethics. In his morality and ethics, Jesus holds the lie and urges us to toe it. In fact, he urges us to step our game. But Jesus has more to teach us. He’s coming to turn the light on for us, to fill in the gaps, and teach about a greater righteousness than morality and ethics could ever give. He’s coming to show us a greater path to righteousness than any 4- or 7- or 10-step program ever could. The Sermon on the Mount is not just about morality and ethics. It’s about Jesus who turns the light on for us and shows us what we’ve been missing all along. He not only sheds light on the fullness of God’s moral expectations, but he also and especially shines the spotlight on the fullness of God’s grace for us and his redemption of us. And that’s game changing. I can’t wait to show you what I mean. Join us this Sunday as we continue our study of the Sermon on the Mount. Matthew 5:17-20.